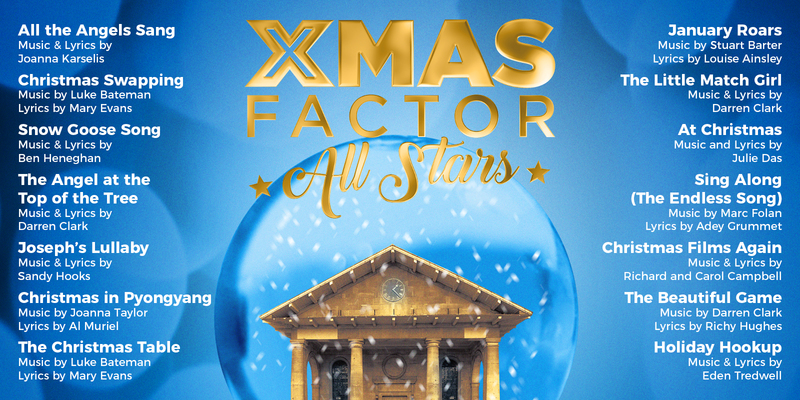 Xmas Factor is back, and this year it’s the All Stars! If you’ve been paying attention Iris this week you may have noticed on Monday that we did a little focus on Workin Process and that we said we’d have more news later this week… Here’s the news! This year we’re celebrating the best of the best from the last four years for our All Stars concert and we want to go a step further: recording an album of the songs to immortalise them forever. But we can’t do it alone! So, this morning we’ve launched a crowdfunding campaign to get us going. You can check it out right here! We’ve got £2500 to raise, which will go towards booking a studio and sound engineer, performers, CD production and licensing so we can release this album of new Christmas songs. That means whether you’re strictly December-only or turning Slade up to 11 from early August, you can enjoy Xmas Factor: All Stars all year round! Your support is hugely appreciated, and over the next month we’re going to be using the blog, Twitter, Facebook and Instagram to meet the writers, and maybe even some performers(! ), to talk about what a difference this album will make for them. Oh, but that isn’t all! Today we’re also announcing the songs and writers who’ve made the cut – our All Stars for the biggest Xmas Factor yet! Check out the Kickstarter for a load more information, including the rewards you can get for joining us on this journey. Thanks for your support!